"The event was very well put together and the table discussions helped to get a lot of things taken care of. You were able to have face to face time with the suppliers, the format was quick and easy, just honest conversation about products." 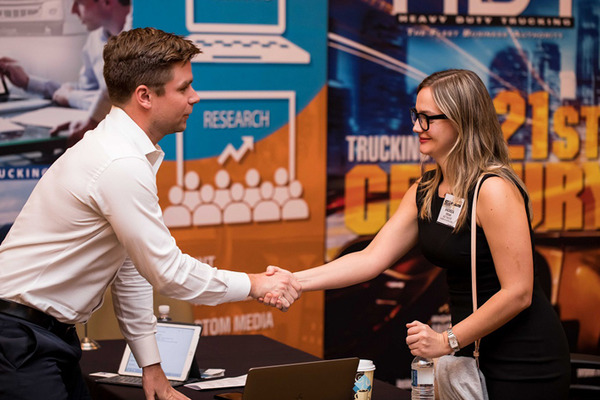 "It's an intimate, focused event with sufficient time to interact with both industry suppliers and other fleet professionals to discuss the demands placed on our business. I would highly recommend this event in the future." “I went into the event hoping to meet a few other operators and gain some insight into improving our fleet. I learned a lot and found a lot of value in several supplier meetings that I didn't expect." “It was a fantastic opportunity to spend one-on-one time with vendors. Unlike large conferences, one can forget who they spoke to because the time spent is in passing. The time talking face to face is invaluable and allows for real connections." "The event surpassed my expectations. Spending dedicated time with various vendors allowed me to make conscious decisions about topics of conversations and the amount of time spent networking with fleets was exceptional." "As a supplier host, we were very pleased! The ability for a manufacturer to have quality interaction and networking time with many fleets was truly a win-win for us and the fleet manager. We would certainly attend this event in the future"
"This is head and shoulders above traditional trade shows when it comes to prime time sales lead gathering." "I can read all day, but I got more out of this than I could get in a thousand magazines. So THANK YOU all who put this together." "It's one of the most valuable events you can attend for your company’s bottom line." Sign up to receive updates here. © 2019 Police Technology eXchange. All Rights Reserved. Produced by Bobit Business Media.